Up to 900,000 people develop blood clots in the United States every year, and the National Blood Clot Alliance says that while blood clots are treatable, about one in three of those diagnosed with a blood clot may die. According to MedicineNet, blood clots form inside veins or arteries as part of the body's effort to repair damage to a blood vessel. But if a clot, which is a gelled mass made of blood platelets and fibrin, forms inappropriately inside the blood vessel, it can cause major problems. When a clot forms where it's not supposed to, blood flow is decreased, which can seriously harm your body. Often the problem with blood clots is that people don't recognize the symptoms, leading to late detection. People also don't understand the factors that contribute to contracting blood clots. Blood clots form in your blood vessels (known as deep vein thrombosis), but they can also break off and travel to your lungs (pulmonary embolism). Both blood clot conditions have different symptoms that are important to be aware of. According to the National Blood Clot Alliance, deep vein thrombosis (DVT) occurs when blood clots form in one of the deep veins of your body, like in your legs or arms. 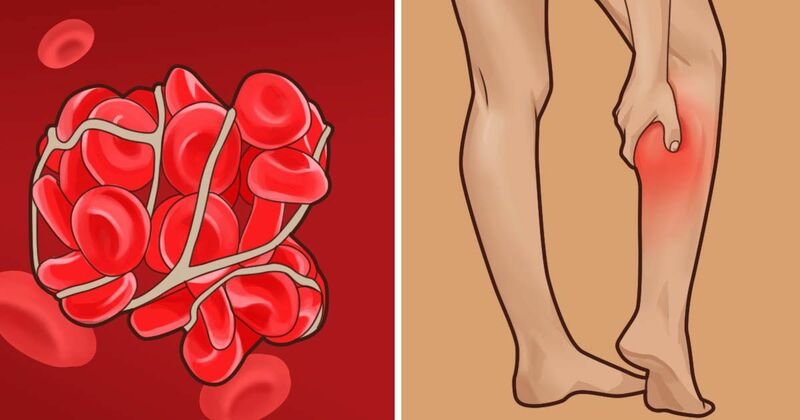 When these blood clots form, the area usually swells and becomes tender, and the pain can be described as a cramp, muscle soreness or a charley horse. The area where the DVT has formed usually distorts the skin color, turning the area a reddish or bluish color. The DTV area will also feel warm to the touch. It's important to contact your doctor as soon as you recognize any of these symptoms because you may need treatment right away. It's important to catch a DVT early on because it can cause major damage, or even break off the vein and travel to your lungs. The signs of pulmonary embolism (PE), according to the National Blood Clot Alliance, are sudden shortness of breath, sharp chest pain that may feel like stabbing and get worse with deep breaths, rapid heart rate, unexplained cough -- sometimes with bloody mucus. If you have any of these symptoms, you should call 911 immediately or head to an emergency room. According to the National Blood Clot Alliance, an ultrasound is usually used to pinpoint where the clot is in the body. If the ultrasound doesn't show a clot, though, and the patient is still experiencing symptoms, an MRI can also be used to detect the clot. There's also a D-dimer test, which tests the blood for the clues that the clotting process has begun. MedicineNet reports that depending upon the location of the blood clot and its cause, treatment may require surgery for its removal. Blood clots can also be treated with anticoagulation medications, which thin the blood. Treatment may include a combination of the two. Blood clot prevention heavily relies on paying attention to the risk factors, which include risks of vascular disease, smoking, heavy weight, high blood pressure, high cholesterol and diabetes, according to MedicineNet. The National Blood Clot Alliance also notes the importance of knowing your personal risk factors, like family blood clot history, and being able to recognize the signs and symptoms of blood clots. Another prevention method suggested by the National Blood Clot Alliance is getting up and moving if you've been sitting or traveling for a long period of time. The alliance also says it's important if you've had surgery or you're sick and confined to a bed to talk to your doctor about your options for preventing blood clots. This common condition can be treated in various ways.